Caroline has over twenty years experience of managing and reviewing technology and risk. Over the last five years she has specialised in privacy and the security of personal medical information. 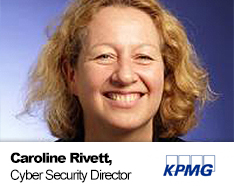 Caroline is the KPMG account lead for cybersecurity and privacy for a number of global pharmaceutical companies. She is a regular speaker at conferences and media commentator on information protection in digital health. Caroline was previously a Chair of the Audit Committee in the NHS for eight years as well as co-founding, running and selling a start-up company which analysed medical records for life insurers.